Hey Skip to My Lou fans! 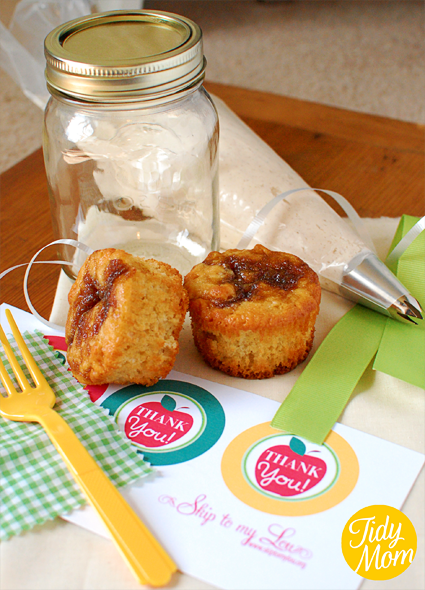 It’s Cheryl, aka TidyMom and I’m so excited to be here today……..I mean, Cindy IS kind of “a big deal” ya know, and I’m just flattered to be here to share my take on a teacher appreciation gift! Baked goods are what I usually use to bribe show my love and appreciation to others, so it only seemed fitting to work with cupcakes today……. I just had to share this picture of me and Cindy ……..you see we talk ALL the time, but had never met, even though we live just 4 hours apart. 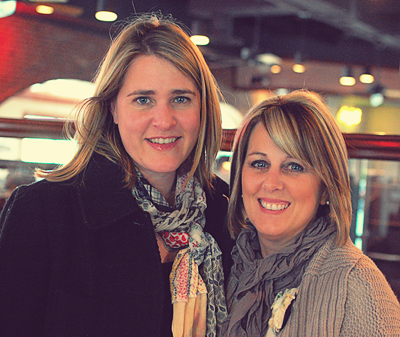 So last month Cindy and her sweet family came to St. Louis for spring break and we got to meet up for lunch! It was like meeting an old friend, no small talk, you just jump right in like you had just seen each other yesterday………Cindy is every bit as sweet in person as she is online! Nothing says appreciation like a cupcake! !…….no wait, maybe that’s my hips! lol Well, they appreciate cupcakes, and I’m pretty sure teachers do to- it’s usually in the handbook, right next to apples. So I though, why not apple cupcakes!! 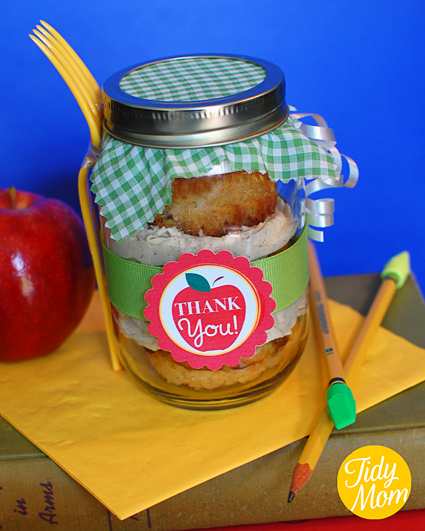 These cupcakes in a jar are super easy and are sure to be all the envy in the teacher’s lounge. In a large bowl, beat butter, milk and vanilla on medium low until smooth and combined (about 1-2 min), scrapping sides of bowl as necessary. Add cinnamon, then slowly add powdered sugar one cup at a time on low until combined, scrape sides of bowl. Increase speed to medium, and beat for 1 min. Add corn syrup and beat on med high for about 30 seconds, then increase speed to medium high and beat for about 1 minute. start with dropping one cupcake inside the jar, then using your icing bag and tip, squeeze buttercream on top of cupcake………repeat until you have 3 layers. * I sprinkled a little cinnamon and sugar on the last layer of buttercream. Now your ready to make it all look pretty! punch out Free Printable Thank You Tag, and attach to ribbon with foam adhesive dots. That’s it ! You’re all set! 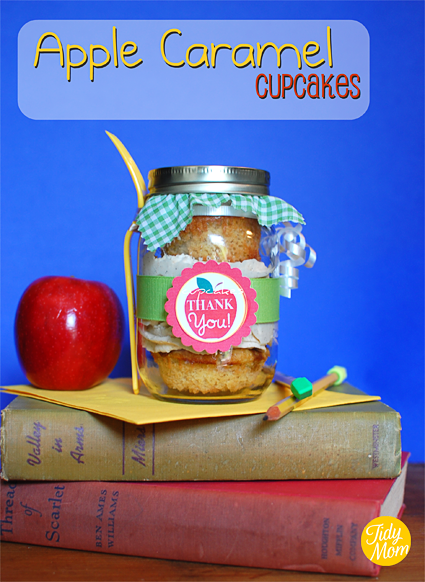 Don’t Forget to Thank a Teacher for all that they do! I made these for my kids' teachers...oh my word! They were adorable and the teachers LOVED them! Thank you SO much for the wonderful idea! FUN idea, Cheryl!! Teachers would be so grateful to receive a gift like this. Finally! An idea I'm excited to use. This is just my style for a gift for the teachers. (and I'll probably try some, too!) Thank you! 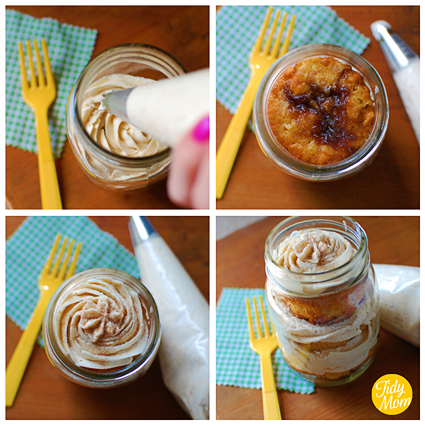 Cupcakes in a jar WITH A FORK! count me in. Amen. just by changing the message and colors on the jar, this fantistic idea could be used for all sorts of gifts. Wonderful,clever and unique. So stinkin cute! What teacher wouldn't just love to receive on of these? An adorable presentation and terrific picture! HOW FUN! I'm planning to meet two of my long-distance blog followers over the summer too. Great isn't it? Nice post. This is super cute (and tasty too!) but how would they eat this? In the jar itself with the fork? Not understanding that part. Really cute! I think ANY teacher would love a sugary pick-me-up like this! And the picture with the books is too cute! Love it! super cute idea!!!!!! this will DEFINITELY go into my teacher thank you arsenal!! !